I was feeling retro with this hair again today, so I thought I’d go find a retro-styled sim (I’m hanging out at Artilleri!) to go with this retro-style dress. I was channeling my inner silver-screen diva in this picture. I love this dress from Lil Big Me, it’s just perfection to me! The polka dots, the bold red, the open-toe sandals, the fitted belt – it’s just super cute! And of course, I’m wearing the TD Baby Girl mesh body. It’s Memorial Day, which means a lot of really important things here in the U.S., and it also means BBQs, beaches, bonfires, s’mores, and oooh so much fun! I decided I’d just lounge around in our pool for awhile until it was time to celebrate in a proper way in RL. I wanted to properly show off the cuteness that is the Payton Bikini Set! It has a super cute vintage pink rose pattern on a soft blue fabric. Pink ruffles on the top and the booty make it just over-the-top CUTE! Not only that, but there’s a matching flip flops, necklace, bracelet, and some sunglasses (that I didn’t wear for this picture) that add to the adorable. I used my floaties from LBM that I wore from the gacha that just went perfect with it. Lil Big Me *just* underwent a huge facelift this weekend and it’s ALL different so you should go there and check it out! I think it’s super cute in a woodland setting! Brand new from Lil Big Me for this round of All The Little Things! 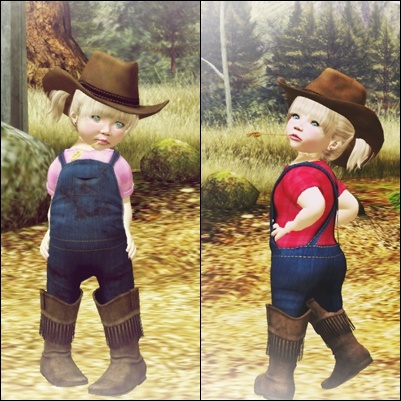 Two absolutely adorable country outfits (that are UNISEX! HOO!) that feature the hat, boots, chewin’ wheat, and clean and messy versions of the overalls! I’m wearing both Pink and Red here, and I’m feeling PRETTY sassy! I shot my pictures tonight at one of my FAVORITE sims EVER! Just Another Tequila Sunrise. You can rez here, and it’s just gorgeous! and of COURSE, the TD body! Lil Big Me had a facelift this weekend. To honor that, Kaitlyn has put on an awesome sale today ONLY you can get 50% off if you’re a group member. And if you aren’t a group member, well, the group fee is waived TODAY! Why are you still reading this, get on down here, y’all! He was lounging in the new mermaid pool, we all love it in our family, I think everyone has taken a dip at one point or another! How can you not?! P.S. Special thanks to Jacob Reanimator for modeling for me! Toddledoo Baby Boy – Of course! 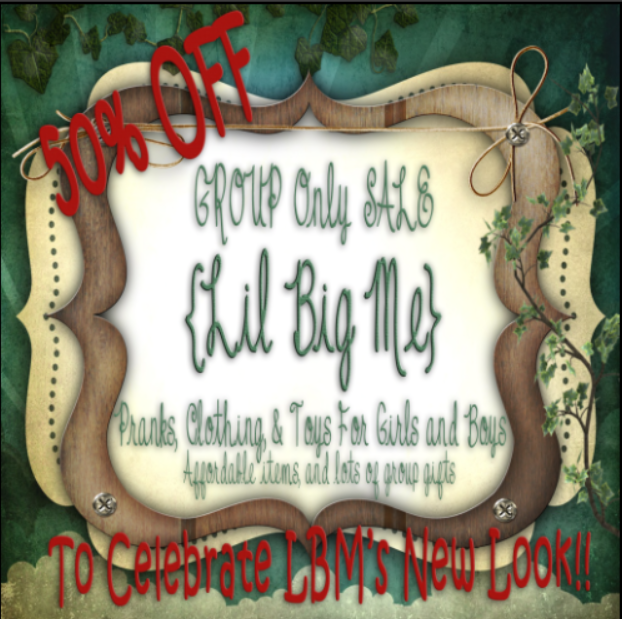 So I just became a model for Lil Big Me! This was a pretty big deal in my book, so I thought I’d show off some of the new releases! I was just lounging in the adorable mermaid pool available at LBM right now and inspiration struck! Time for a bathing suit photo shoot! Woo hoo! I can’t get over how absolutely AWWDORABLE these swimsuits are! Oh my gosh. I feel like a sparkly mermaid ready to hit the beach in these things. The retro cuts are awesome as well, and I enjoy all the prints. I don’t think you can go wrong with any swim suit at LBM! Plus if you join the group, you get lots of group gifts AND a discount when you buy items from her in-world store! All swimsuits are by Lil Big Me! Featuring: Payton Bikini, Mini Retro Swim Suit, Black Mini Retro Suit, & Coral Mini Retro Suit. Hair: Rezology (Epicure), Magika (The Wish), & ploom (Wurlie).